We present an ab initio calculation of the quark mass dependence of the ground state energies of 4He , 8Be and 12C , and of the energy of the Hoyle state in 12C . These investigations are performed within the framework of lattice chiral Effective Field Theory. We address the sensitivity of the production rate of carbon and oxygen in red giant stars to the fundamental constants of nature by considering the impact of variations in the light quark masses and the electromagnetic fine-structure constant on the reaction rate of the triple-alpha process. As carbon and oxygen are essential to life as we know it, we also discuss the implications of our findings for an anthropic view of the Universe. We find strong evidence that the physics of the triple-alpha process is driven by alpha clustering, and that shifts in the fundamental parameters at the ≃ 2–3% level are unlikely to be detrimental to the development of life. Tolerance against much larger changes cannot be ruled out at present, given the relatively limited knowledge of the quark mass dependence of the two-nucleon S -wave scattering parameters. Lattice QCD is expected to provide refined estimates of the scattering parameters in the future. 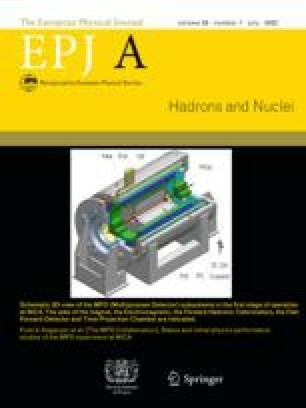 Contribution to the Topical Issue “Lattice Field Theory Methods in Hadron and Nuclear Physics” edited by Simon Hands and Hartmut Wittig. H. Oberhummer, A. Csótó, H. Schlattl, arXiv:astro-ph/9908247. E. Epelbaum, U.-G. Meißner, W. Glöckle, arXiv:nucl-th/0208040. E. Epelbaum, J. Gegelia, arXiv:1301.6134 [nucl-th].